John Deere 32 oz. 10 W-30 Motor Oil is a 4-cycle, multi-viscosity oil engineered to stand up to high ambient temperatures. The oil is safety-tested and durable to ensure your tractor's engine stays well-lubricated. StarTron Enzyme Fuel Treatment - cures ethanol fuel problems.. Single dose twin pack, contains (2) 30ml bottles.. Works in all 2 & 4 Cycle engines and in all fuels. Makes engines start easily, run smoothly. Stabilizes fuel for up to 2 years. Removes gums, varnish & water, and helps prevent phase separation. StarTron is a unique multi-functional enzyme fuel additive that improves performance, cures ethanol fuel problems, stabilizes fuel & more. You'll feel the difference from the first time you use it! Treats up to 183L of gasoline.Safe for all gasoline engines - overdosing not harmful. Removes gum, carbon, and varnish; Cleans carbs, injectors, and valves. Stabilizes gasoline for up to 2 years. Disperses moisture throughout fuel as sub-micron sized particles that can be safely eliminated as engine operates. Helps prevent fuel phase separation.Usage instructions included in package. MIB Fuel/Engine Revitaliser 118 mL Fix poor or non-running engines with 4 oz. Mechanic in a Bottle. This synthetic fuel additive works in your power equipment with 2-cycle and 4-cycle engines. 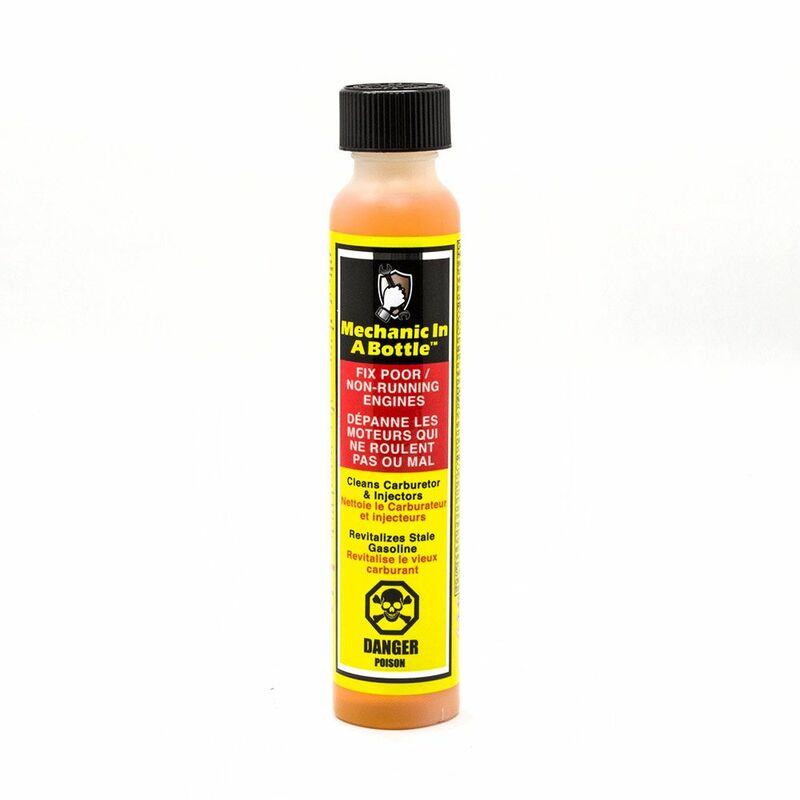 It removes all varnish in the fuel system without having to remove the carburetor, removes carbon deposits, removes water, reconditions rubber and plastic components and revitalizes old fuel. Mechanic in a Bottle rejuvenates your equipment's fuel system so that it starts efficiently and operates in top condition. MIB Fuel/Engine Revitaliser 118 mL is rated 4.3 out of 5 by 230. Rated 5 out of 5 by John from I was pleasantly surprised such a product existed. It worked... I was pleasantly surprised such a product existed. It worked great!! Even on a non-starting engine. Rated 5 out of 5 by mlsnell05 from It helped me to bring my tractor back from the... It helped me to bring my tractor back from the dead. Love this product.